A couple of weeks ago, I was very lucky to nab some time off work along with some flights to Panama, where I headed to for four days to meet up with a friend. 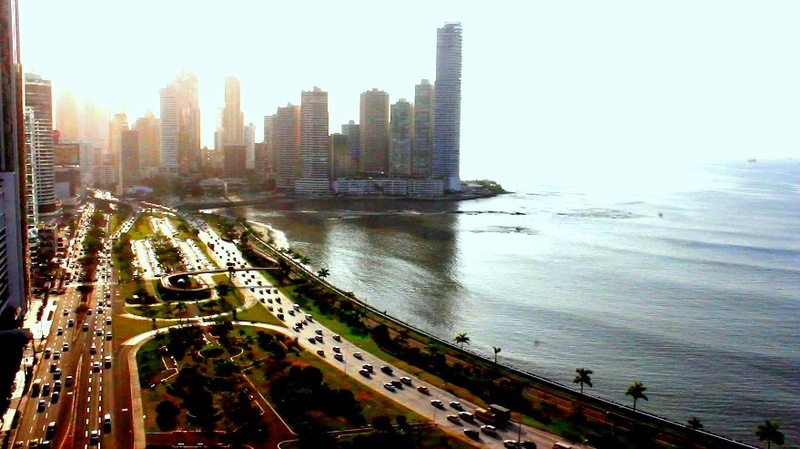 Panama lies just an hour’s plane ride away from Colombia. Home to a buzzing capital and some absolutely beautiful beaches, I couldn’t wait to see what Colombia’s next door neighbor had to offer. Panama city itself is a real melting pot of races, and food wise this means there are cuisines from all corners of the globe. In my brief stay in the city, I munched on some New York bagels for breakfast, a traditional Panamanian plate for lunch, and enjoyed a cracking Italian pizza for dinner. Not bad for a days work! 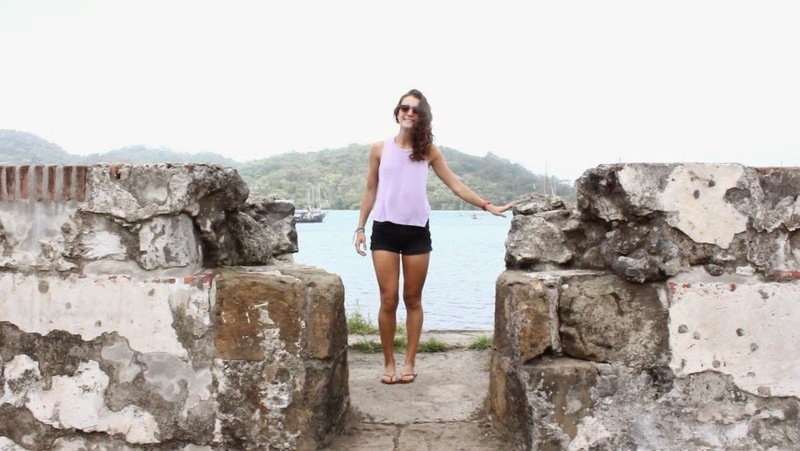 Moving away from the city, on my second day we made a short trip to the Caribbean side of the country and headed to an island called Isla Grande. The change from the cosmopolitan city to the completely tropical Caribbean was amazing to see. Landscapes shifted from high-rise apartment blocks to completely green hillsides and a gorgeous clear sea. 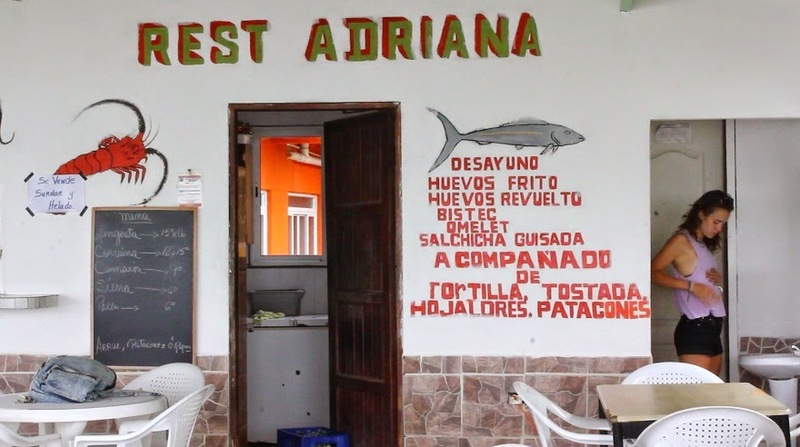 The food was just a spectacular as the view, something I discovered when we headed for lunch to the classic spot Restaurante Adriana, frequented by lots of surfers who head to the island. 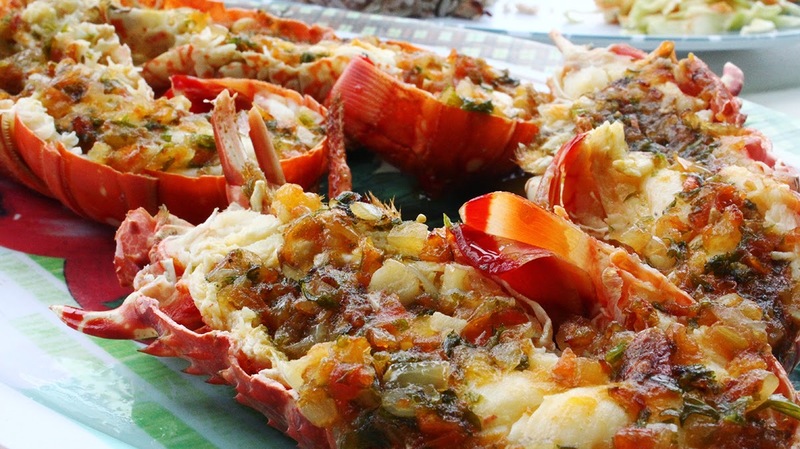 The menu was simple and consisted of the day’s freshest catches..luckily for me, this happened to include lobster. My order was not a difficult one! Langostino al ajillo (lobster in a garlic sauce) came accompanied by arroz con coco (coconut rice), a salad and the typical patacones (fried plantain rounds). Simple, fresh, and completely delicious, I devoured every last bite on my plate. The lobster was so flavorsome and had the absolutely perfect texture. I was determined to get the recipe for the ever-so-simple yet truely incredible garlic garnish, but I was told by the owner Adriana that “es un secreto” (it’s a secret). Despite being able to guess it’s main components (garlic, parsley, onion), part of me thinks no matter how hard I’d try it would never turn out half as good – probably best it stays a secret in Isla Grande! Leaving the Caribbean it was by no means goodbye to the beach, as the next day we set off for the Pacific side, to a beach called Playa Venao. After a long 5-hour car journey over there, it was lunchtime – again! Stopping off in the nearby town Pedasi to eat, you can guess what was on the menu, and after claiming I fancied chicken, I quickly looked around, saw the sea, and laughed at myself. Chicken in the city? Sure thing. Right next to the sea with some of the freshest fish and seafood in the country? Well…probably order yourself a fish dish then! 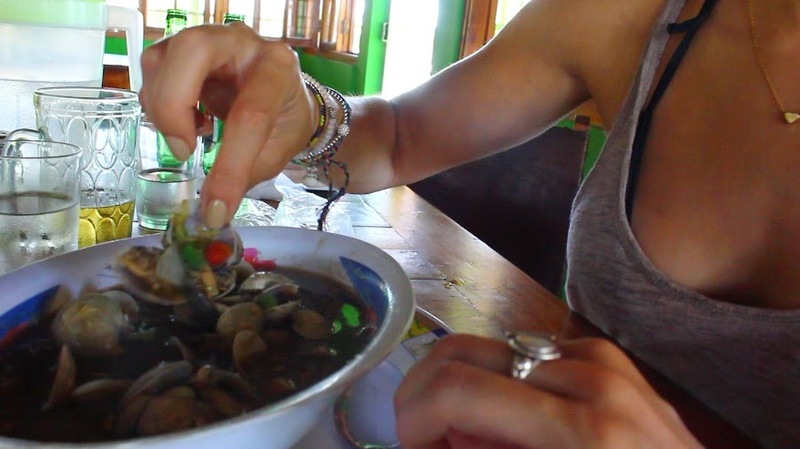 We went all out and even ordered a starter of almejas (clams) in broth. A really tasty dish, these clams came in a dark, salty sauce, and were the perfect thing to whet our appetite. 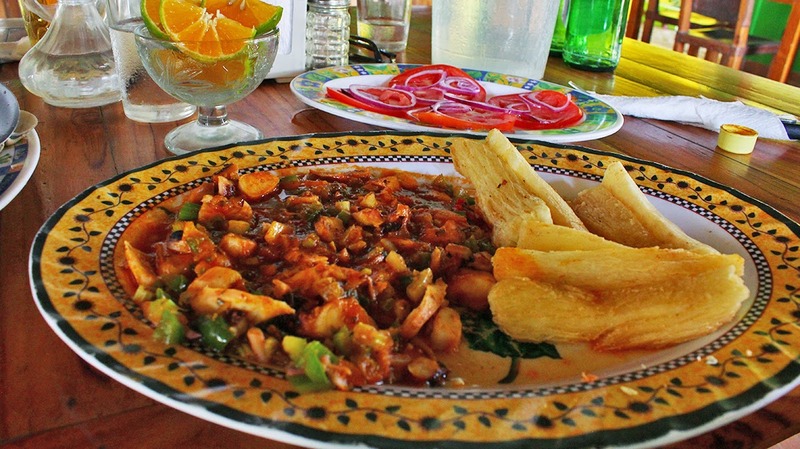 And then came the main attraction – pulpo a la criolla, or squid in a tomato sauce. The squid came with an option of rice, patacones, or fried yucca. I opted for the yucca, as I absolutely love the stuff. If you’ve never tried it I highly recommend you do. It’s a starchy root vegetable with an almost sweet flavor. Served like this, as chunky chips, they are divine and a great side to mop up the tomato-y sauce. Yet another successful almuerzo down, we headed off to the beach. A few more days of sun, sea and and seafood and it was soon time to head home. I really fell in love with Panama and everything I was able to see of it. 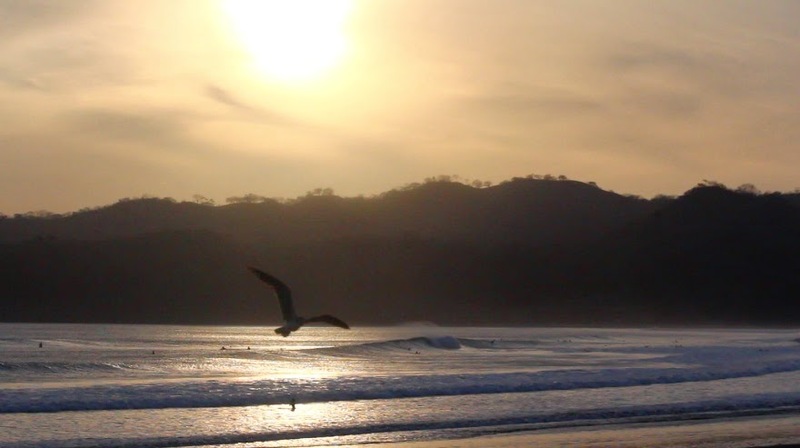 The city had a cool vibe, with lots going on, and the beaches and coast were some of the most beautiful I’ve seen. With it being so close to Colombia, I definitely want to head back at some point and explore a bit more. 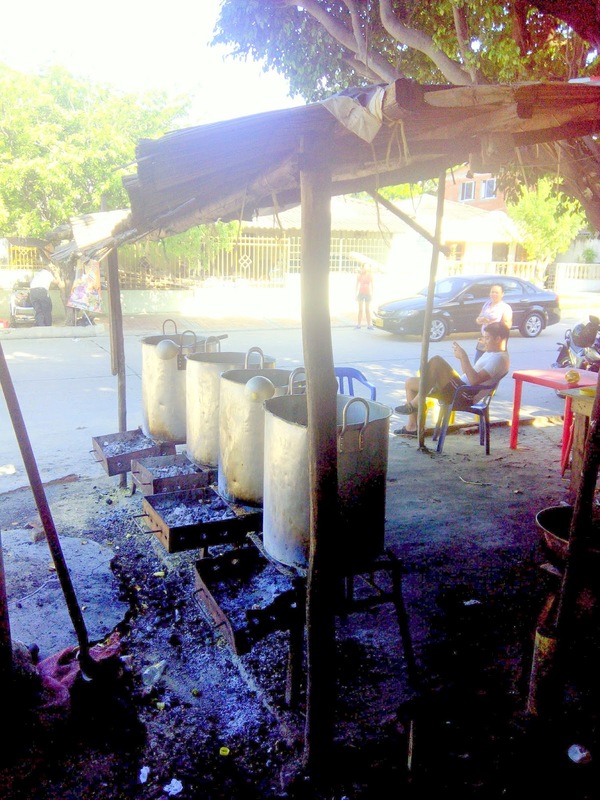 Stomach soup, fried pig ears and building roofs – and it’s only lunchtime! Or, if in Colombia -just eat lunch. Because here lunch is not to be taken lightly, both in the figurative and literal sense. 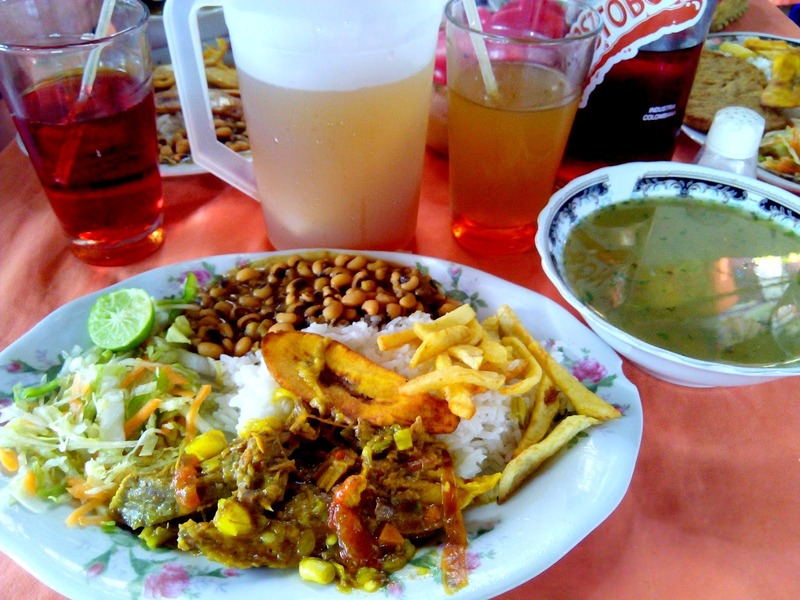 The typical almuerzo corriente (‘fast lunch’) consists of a soup for starters, rice, either beans or lentils, possibly plantain or yucca, a salad and a piece of meat or fish. The price will range from COP 5,000-10,000 (£1.50-£3.00). 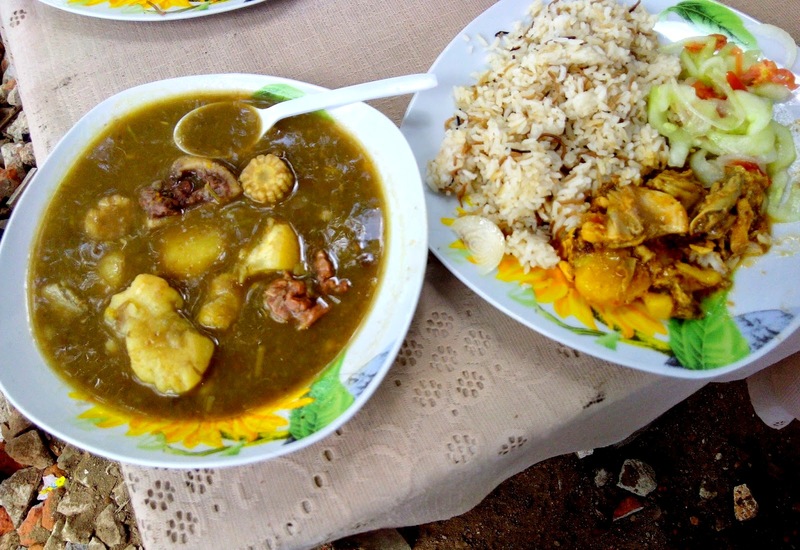 This makes this midday meal a great way to sample the local cuisine without breaking the bank. Here’s a look at some of my recent lunchtime eats here in Barranquilla. I’ve found myself in a few comedores (cheap eat places) where a health and safety officer might have a heart attack, but as I’m still standing to tell the tale and continuing to seek out these places, I’d say the dubious state of hygiene only adds to their rustic charm. Totuzmo is probably ‘rustic charm’ personified. This cornerside comedor, with it’s thatched roof and outdoor kitchen, is about as low-frills are you can get. 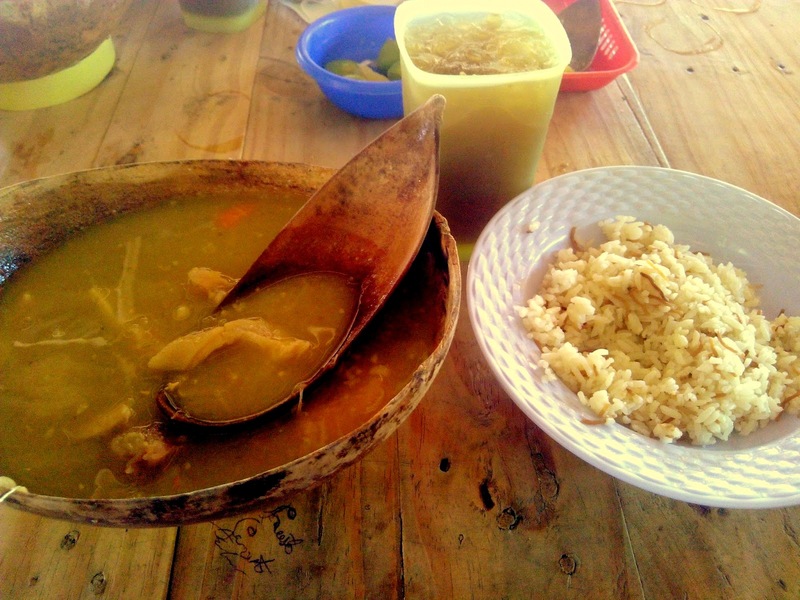 The specialty here is soups, which all come accompanied with rice and agua panela (sugar cane water).Each soup comes served in a bowl of totuma – the dried and hollowed out shell of the fruit from the totuma tree. The photo below is an enormous bowl of mondongo – tripe soup. Now this may not be everyone’s cup of tea, but I absolutely adore this dish and given that it’s a delicacy here I’d say that’s not just my weird offal-loving self speaking either. This whole meal cost COP 6,000 – that’s £1.25! To anyone over here in Barranquilla, this place is a must visit. Find it at Carrera 56 # 49. ‘The city centre….is inhabited by wild street commerce – it’s actually one market stretching to the river like a flattened shanty town‘. Welcome to my city! This extract comes from a Lonely Planet guide to Colombia and it is indeed true – the city centre of Barranquilla is a lot like mayhem. But those people who endure its chaotic streets, merciless bus drivers and general disorder will be rewarded with some absolute bargains and excellent local food too. Food in the centre has character and personality, something I’ll choose over sterile, soulless chains serving me my food in air-conditioned shopping centres any day. From every fresh fruit under the sun to fried pig ears (really), if you’re looking for a bit of excitement this is the place to come. On my most recent trip into town, I was on a mission to find the best almuerzo around. 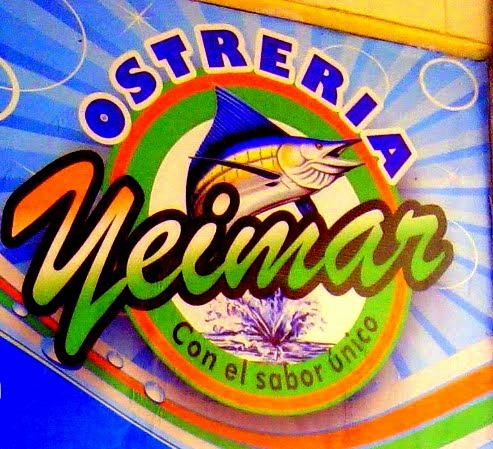 Upon recommendation, I headed to Osteria Yeimar for a corrientazo. Osteria translates as oyster bar, but given that this is downtown Barranquilla, it was less oyster bar and more fisherman’s shack. Yeim ar had everything from cocteles de camaron (special seafood cups, not alcoholic cocktails) to cazuelas de mariscos, gorgeous seafood stews. I opted for the set lunch, but when choosing my fish, my Spanish failed me – I was left clueless as to what anything on offer actually was. Not to worry, as the owner simply took me to the kitchen to select whatever fish I fancied. I went for the mojarra, and while I’m still unsure of an English translation, all I can say is it was a good choice. 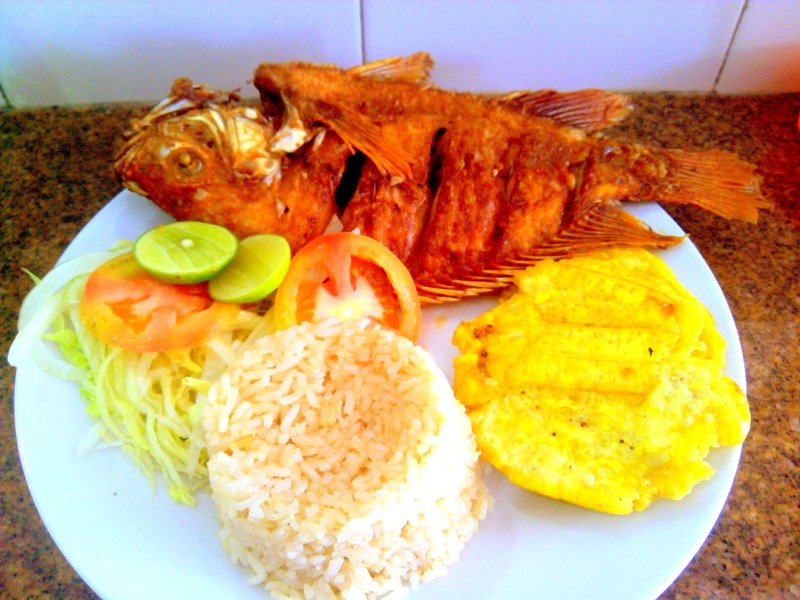 A meaty fish with not too many bones, it came whole and deep fried, accompanied by coconut rice, patacones and salad. When having to choose between a typical costeño lunch in the heart of the ‘wild street commerce’ and a Subway sandwich in a shopping centre? You know where to find me. Ede works in our school, and her general job is to keep everything clean, everyone happy and as a side task – well fed too. With Ede you can order your own almuerzo corrientazo straight to the staff room for the wonderful price of COP 5,000. 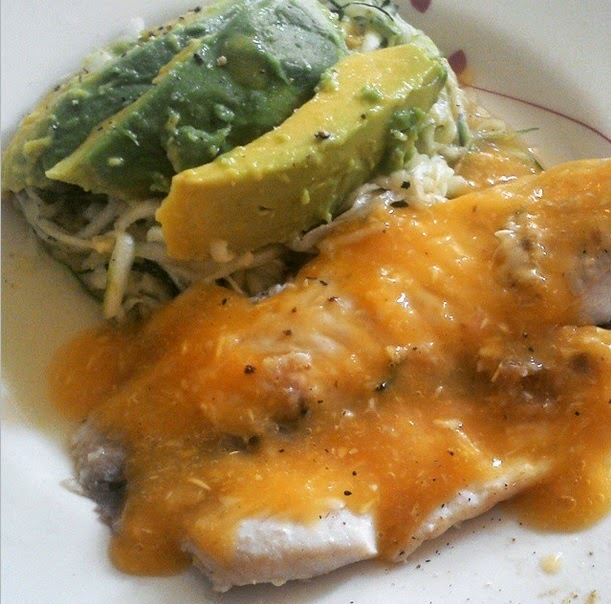 Below is pollo guisado (chicken in a tomato based sauce), coconut rice, boiled yucca and avocado salad. The soup on the side is mote de queso – a typically costeño cheese and yam-based soup. As well as teaching at my school, I’ve also spent a fair bit of time at our nearby university taking dance classes. It’s a huge university which offers up a wide array of places for students and staff to grab a bite to eat. You can dine at one of the fancier restaurants on campus, or, of course, grab a corrientazo. One particularly good place is called Rancho Norte, just outside the uni. This was carne gusiada (beef in a tomato sauce) with white rice, black-eyed beans, salad and plantain, Oh, and should be leaving hungry, there’re chips too. The soup is actually sopa de hueso, which is bone soup. If you think of it as just a tasty meat stock (which it is), the weird sounding name shouldn’t phase you. That enormous jug of drink is all for me – iced tea, which is very popular here. A sad moment when I was first offered ‘tea’ and thought I had landed in a country that drunk tea like the brits. Perhaps, but theirs is ice cold with tons of sugar. PG tips: I miss you. 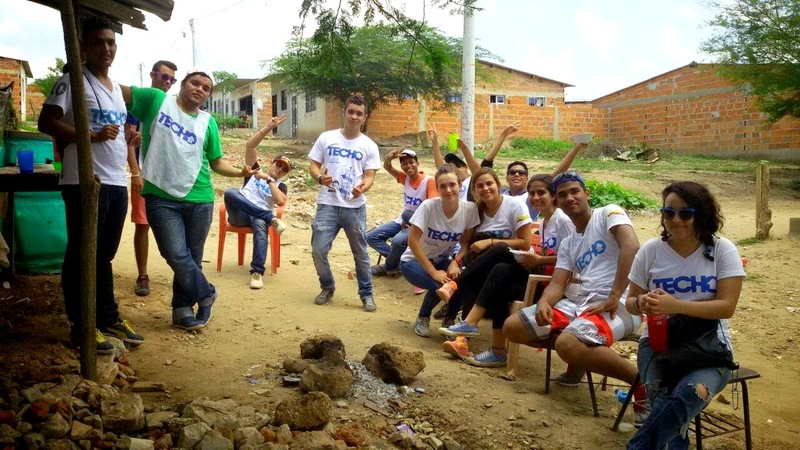 Here in Colombia I’ve been working with a charity called Techo, which means roof in English. Techo is an organisation which helps build emergency housing for people living in substandard housing throughout Latin America. I work in the area of detection, and each Sunday we visit certain neighbourhoods to carry out interviews with families.Through these interviews, we then carry out a needs assessment and from that information assign housing. It’s an incredible charity, and if you want to find out more click you can by clicking here. The families who receive emergency housing are obliged to provide a percentage of the cost for the housing. As a means of raising this money, after one of our visits to a neighbourhood in nearby Galapa, we were all invited by a family to a delicious almuerzo. 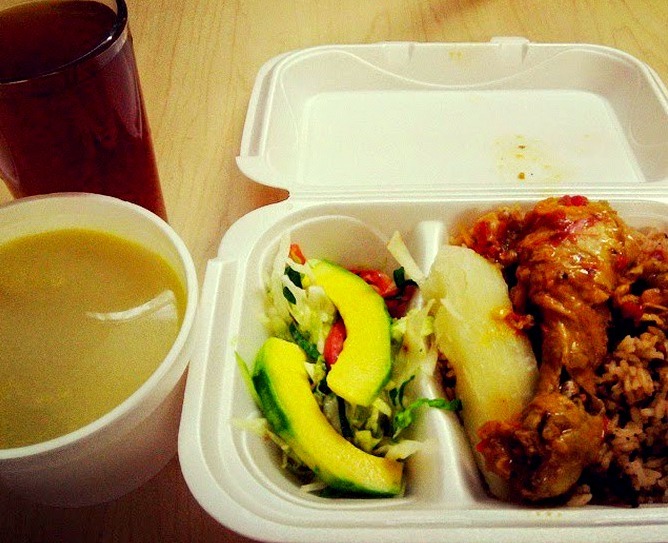 This lunch consisted of a lentil, plantain, yucca and beef soup, which came alongside pollo guisado, rice and salad. It was a really tasty meal and just what we wanted after a tiring yet rewarding mornings work. The price we paid for the lunch all went as a contribution to the families portion of the cost for their new housing. As well as leaving satisfied and well-fed, it was great to know we were also able to be a part of the families fund-raising efforts for their new home. From stomach soup to the wild city centre and it’s fried pig ears (but far more enticing fried fish), to cheese soup and being part of a families fundraising efforts, you’ve caught a glimpse into lunch in Colombia. It is a time to take a break from the day, sit back and enjoy a proper meal. And I like this way of living a lot. How many people eat lunch at their desk? How many people have skipped lunch due to a lack of time? Take a note out of Colombia’s book, and give yourself a good mid-day meal. And plenty of it too!